Cadets at the Air Force Academy took the former Gulf War leader at his word when they helped the Air Force and one of the Academy’s research partners, a public firm specializing in biology and applied physics, test a prototype of a human-behavior sensor designed to check their perspiration, March 12. The sensors, designed by GE Global Research, one of many Defense Department research partners, were attached to the cadets’ backs on a belt above their waist. “That part of the back is one of the sweatiest areas. It’s like a pool back there,” said” Lt. Col. Chad Tossell, director of the Academy’s warfighting effectiveness research center in the school’s behavioral sciences department. 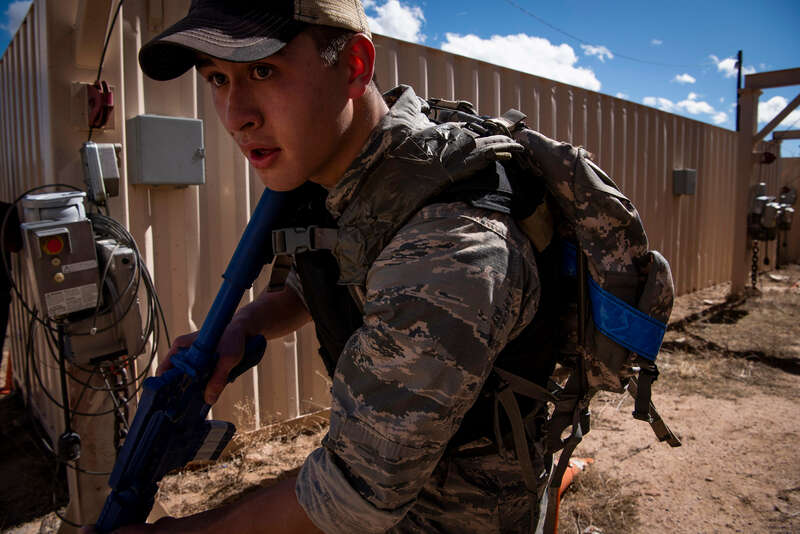 Tossell watched the eight cadets sweep through the Military Operations-Urban Training village in Jacks Valley while carrying 45-pound backpacks and training rifles. The day-long testing activities also took the cadets, all members of the Academy’s combat shooting team, through a series of warm-up exercises, two 1.5 mile ruck marches, and various briefings. “This is about cadets and capability,” he said. When cadets perspire, the sensor records potassium and sodium levels in their perspiration and sends the data to a cellphone app or computer, said Cadet 1st Class Dave Culver, one of four systems engineering students who organized the logistics for the day’s activities. “Each cadet testing a sensor today has the app with them,” he said. Tossell said the Academy is known across the DOD and in the research and development realm as an optimal setting site to try-out burgeoning technology. Cadet 3rd Class Isaac Perkins participated in the March 12 test. The sensor patch’s first generation was lab-tested with simulated sweat by GE Global Research. Additional physiological performance testing occurred at the signature tracking for optimized nutrition and training laboratory under Strang, according to a 2018 news report from Wright Patterson. “These tests allow me to develop and validate next-generation sensor technology with a representative population — cadets training to enter special operations career fields,” Strang said. Strang said the Academy is a boon to the AFRL and the DOD due to its opportune testing environment. “I can evaluate the state of these sensors, identify tech gaps and decide how the AFRL needs to meet those gaps, either through internal research and development or funding commercial performers to reach our goal: a robust set of sensors to assess performance states,” he said. Perkins appreciates the influence research at the Academy has for the DOD on a global scale. Due to weather conditions March 14, testing of a similar product designed by Northwestern University researchers was cancelled. Tech Warrior is an annual AFRL exercise taking place in the fall. The event is designed to provide scientists and engineers the opportunity to participate in an intense battlefield immersion training exercise with Airmen they create new technologies for.